Animals in intensive production conditions are subjected to intense contact with air, dust particles, ammonia and microorganisms while breathing, which may irritate and infect their respiratory tract. BroClear is an advanced phytogenic product, composed of carefully selected bioactive ingredients to support the respiratory health of animals. BroClear strengthens the respiratory tract defense and alleviates the symptoms related to respiratory infections. It allows fast intervention and flexible use thanks to its presentation as a drinking water supplement that is easy to handle and highly water-soluble. These combined actions result in enhanced vaccination efficiency, improved pathogen resistance and higher oxygen uptake. 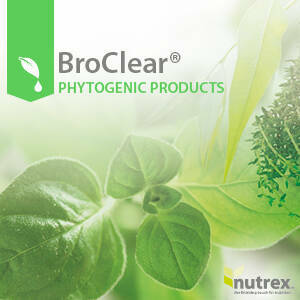 By combining the best that nature has to offer, BroClear stimulates appetite, general well-being and performance.